The Planetary Visions Satellite Imagemap combines data from three satellite systems and four digital maps to give the most complete and realistic cloud-free Earth texture map of the entire land and sea surface. Areas of forest, mountain, desert, ocean and ice cover are easily recognised in their natural colours. The use of digital satellite images with accurate geometric processing and consistent colour gives a stunningly realistic view compared with traditional topographic and political maps, or physical maps based on artistic impression. Unlike 8-bit coloured vegetation maps, the use of full-range satellite images gives our Earth texture map continuous 24-bit colour with no visible steps. 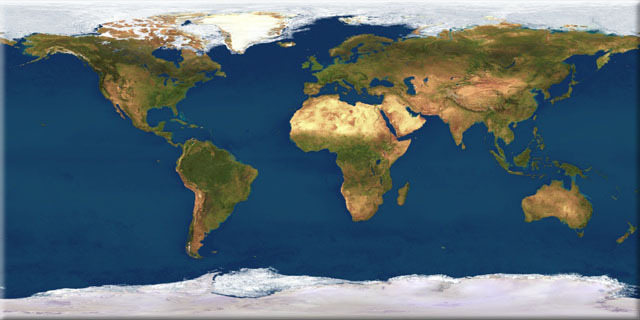 The Earth texture map is available for licensed use in film and television graphics, print and multimedia titles, museums, exhibitions, advertising and merchandising, with global, continental or user-defined coverage. It is being continually improved as new data becomes available. The world texture map is held in a geographical coordinate system based on a latitude-longitude grid for easy combination with other geographic data layers, eg, digital terrain, water and political masks, nighttime imagery, clouds, and bathymetry. Linework such as coastlines, borders, rivers, roads and railways may be directly overlaid without registration errors.